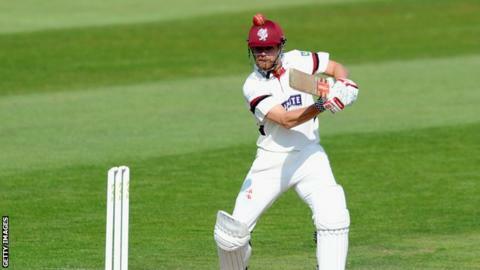 James Hildreth hit his fifth hundred of the season as Somerset took control on day one against Warwickshire. The 31-year-old hit an unbeaten 118, with 17 fours, sharing a 101-run third-wicket partnership with Somerset captain Marcus Trescothick (87). After a slightly delayed start, Tom Abell, the Championship's Breakthrough player of the year, was caught behind cheaply off Oliver Hannon-Dalby. Keith Barker then picked up two wickets, as Somerset closed on 360-5. Somerset included fast bowler Alfonso Thomas following the announcement that he is to leave the county after eight years, but the hosts chose to bat in the final match of the season at Taunton. Warwickshire debutant Mark Adair picked up his maiden first-class wicket as Trescothick looked to drive the right-arm seamer and was caught by Tim Ambrose. "We needed to do certain things going into this game to make sure we got maximum bonus points so this was the perfect start. We have got a solid platform to get to 400. "There was definitely some pressure because we knew we had to perform and make sure we got the points. And the way Tres led with his batting and the intent with which he went about it was excellent. "It's a good wicket but there is a little bit of turn out of the footholds for the spinners which will be interesting as the game goes forward." "It looks a pretty good surface out there and we probably had to make a bit more use of the new ball when the new batters came in. Marcus Trescothick and James Hildreth are two very good players and made it pretty difficult for us. "Keith took a couple of wickets later in the day and Rikki, in his first spell, looked very hostile and Jeetan Patel also did a very good job for us."